The 'Queensland Colonial Dancers' (now known as the Queensland Colonial and Heritage Dancers) was formed in 1984 to promote and preserve the dances done in the early days of Australian history and those of today at Bush Dances and Colonial Balls. These dances have evolved from Anglo-Celtic-European influences and new ones are being devised using traditional music, formations, steps and movements. They have performed at many places, including EXPO in 1988, the Opening of South Bank in Brisbane in 1992, the National Folk Festival in Canberra in 1994, 1995, 1996 and 1998 and even on board QE II in 1995. They were regular performers at the Colonial George Street Festival and many other festivals, including the Australia Day celebrations. Each year, in June/July, they hold a Colonial Ball and re-create a bygone era, where they enjoy the dances of last century, including waltzes, varsoviennes, schottisches, quadrilles, polkas, jigs and reels; the music being played by the 'Champion Moreton Bay Band'. Dance lessons are held in the month prior to the ball so newcomers can join in the fun! The programme now includes dances from other heritages that are appropriate to the many cultures of the settlers who came to Queensland. Since 1999, at the 'Fourteenth Annual Colonial and Heritage Ball' in Brisbane, they have included the 'Brisbane Quadrille' and the 'Ballroom Lancers' - dances found in a Dance Manual published in 1884 and interpreted by the 'Queensland Colonial and Heritage Dancers'. The 'Rockhampton Alberts' and the 'Pine Mountain Lancers' have also been revived. To celebrate the Centenary of Federation 2001, the Sixteenth Annual Colonial Ball traced the history of the dances through the years from 1803 to 2001. 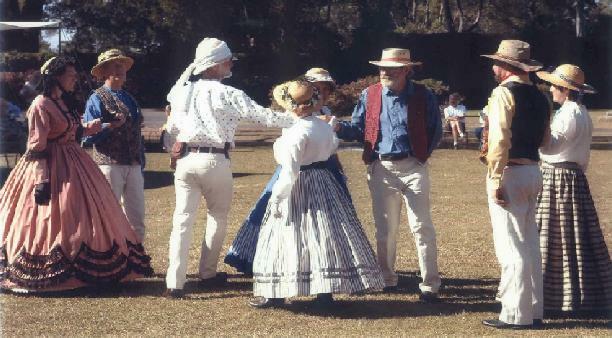 In 2002 the 17th Annual Colonial Ball celebrated the Year of the Outback. In 2003 and 2004 the balls continued to celebrate the dances of many traditions present in Queensland. In 2005 we celebrated our 20th Ball. In 2006 we hosted the Colonial and Heritage Ball at the National Folk Festival in Canberra.